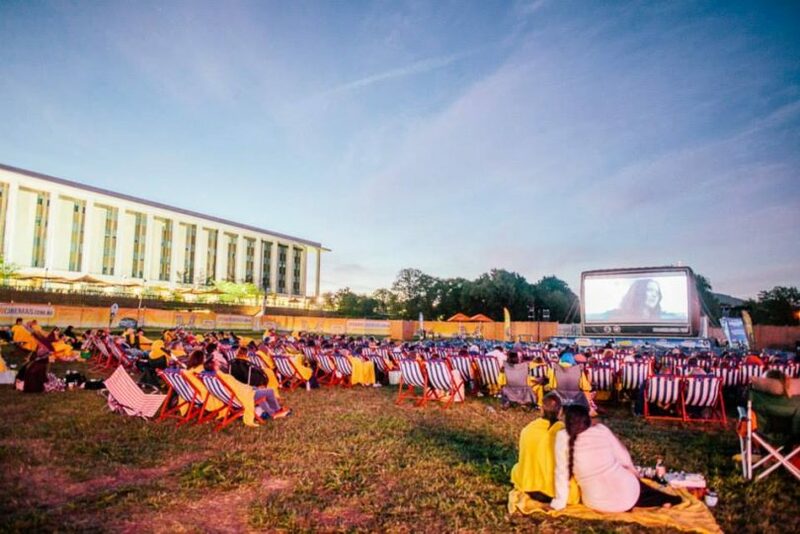 The Patrick White Lawns next to the National Library of Australia will be buzzing over the lazy days and nights of summer with the American Express Openair Cinemas. Photo: Supplied. Canberra’s clear, warm summer nights present the perfect opportunity to sit back and enjoy the latest film releases, cult classics and family favourites at the American Express Openair Cinemas, which kick off 11 January on the Patrick White Lawns in Parkes. Organisers are also promising 40 events – including live music, DJ performances and fine food – during the festival-style affair, which runs until 25 February. The film program ranges from new releases like Wonder with Julia Roberts and Owen Wilson, to cult classics like The Rocky Horror Picture Show. On Friday evenings the Pepsi Max DJs will get the party pumping with summer’s newest tunes, while on Saturday the Visit Victoria promotion will showcase the sights, sounds and tastes of Melbourne’s vibrant cultural scene. In a joint bid to champion food waste prevention, American Express Openair Cinemas has teamed up with OzHarvest to present Soul Sundays; a session of delicious food sampling, trivia, music and games for all the family. A $3 donation from each ticket purchased will provide six meals to those in need. Meanwhile, purveyors of fine food and authentic Italian cuisine, Salt Meats Cheese, will transport diners to the streets of Naples as they host a series of alfresco long-table dinners. A delicious three-course meal paired with wine will be served at three one-of-a-kind events. Head chefs Stefano De Blasi and Edoardo Perlo, who share a mutual passion for honest cooking and quality ingredients, will curate the daily menu of irresistible dishes available throughout the cinema season. Their signature Truffle Pecorino Pasta; cheesy truffle pasta tossed through a wheel of truffle pecorino, finished with a grating of extra truffle pecorino, promises to be a firm favourite along with their arancini antipasti and wood-fired pizzas. To wash it down, the bar will be serving cocktails from Melbourne Martini and refreshing twists on summer classics as well as Frosé, Aperol Spritz, 4Pines craft beer and Giesen Wine, plus cinema essentials, ice cream and Red Rock Deli popcorn. Wonder – based on the New York Times bestseller, Julia Roberts and Owen Wilson star in this inspiring and heartwarming story of a young boy trying to fit into society. Jumanji: Welcome to the Jungle – four teenagers discover an old video game console and are drawn into the game’s jungle setting where they find out they must play to survive. Coco – aspiring musician Miguel teams up with charming trickster Hector on an extraordinary journey through the Land of the Dead. The Greatest Showman – Hugh Jackman stars in an original musical that celebrates the birth of showbusiness and tells of a visionary that became a worldwide sensation. Pitch Perfect 3 – following their epic win at the world championship, the now separated Bellas reunite for one final singing competition. The Post – Inspired by true events, Meryl Streep and Tom Hanks star in the cover-up that spanned four U.S. Presidents. La La Land – enjoy a date with Ryan Gosling and Emma Stone this Valentine’s Day as they chase their dreams in this romantic-comedy. Dirty Dancing – nobody puts Baby in the corner. Rocky Horror Picture Show – let’s do the timewarp again with this cult classic. And there’s no need to leave Rover at home, with ‘Doggy Dates’ welcome to any screening. Pampered pooches can enjoy the VID treatment with a ‘pawfect’ picnic platter of doggy donuts courtesy of Darby’s Dog Bakery & Deli and their very own canine couch. If you have an American Express Card, you can enjoy the full VIP cinema experience by purchasing a ticket for the American Express Invites Lounge. Card Members get their own lounger, a cushion and blanket as well as some tasty treats. They can also enjoy 15 per cent off selected tickets when purchased with their cards as well as complimentary blanket hire. For non-Amex Card Members, there are a variety of seating options available, with a blanket and lounger available for hire as part of any ticket package. Premium tickets to the Star Lounge include reserved seating on a comfy lounger, service straight to your seat and a glass of wine. For more information and to be part of the conversation go here.